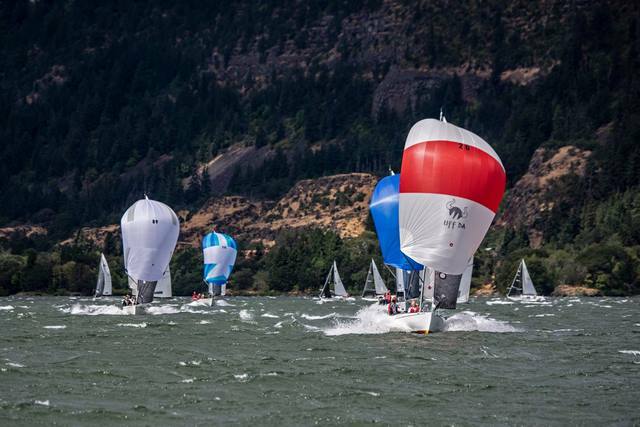 Moore 24 Nationals in Hood River, Oregon, one of the most consistently windy places to sail in our country and if half of what is written above is true one of the most fun and active towns you can imagine. A sailing venue I always think of with a little trepidation in the weeks before – why are going here – man that’s a hassle to get down there – it’ll be too hot and too windy – things are going to break – we are going to wipe out. You know, all the normal stuff to be worried about. We’re going somewhere to race that the Opti’s don’t sail at, where the only keel boats to have a one design regatta at the venue is the Moore 24’s and where the sailboards and kiteboards shine and rip around in places with names like Swell City – but then you get there and take in the scenery as you are welcomed in and get to welcome in all the different players in the theatre that is a Moore 24 Regatta. 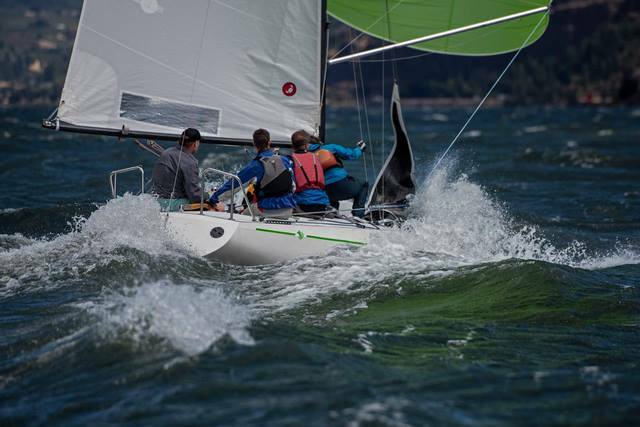 The Sailing is always great, the wind is usually incredible and the sailors in the fleet are top notch, but it’s the players, the actors in this regatta that make it what it is. Competing from Hood River Oregon and first on the entry list is Doug I’ll Make it Happen and I had the best holder 20 wipeout ever Archbald and crew on #111 Morjito with Matty I don’t need a life jacket McQueen (yes he’s related to King of Cool Steve, and yes he threw the vhf in the water) aboard. 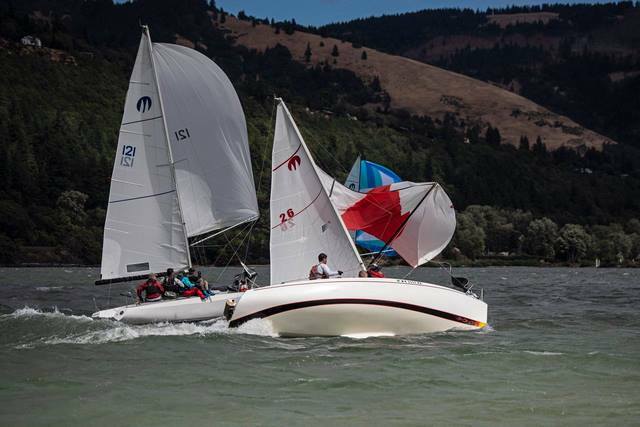 Another Home town Hood River Oregon Boat is Dave Jelly Man Gee and crew aboard #23 Space toaster with calm and cool Tyler Splice Master DuroKnot Beck aboard. Hailing out of Corte Madera (no it’s a city not a fortified bum wine) California is John skinny trailer Kernot and crew aboard #118 Banditos with Dave Soft Ball King Hodges aboard on the helm. Hailing from Corte Madera (no it’s a city not a fortified bum wine) California is Peter no it’s not Schoen Yes that fanny pack is a lifejacket #89 Mooretician and crew with Joe is that a new brewery Wilderman aboard pulling the strings. 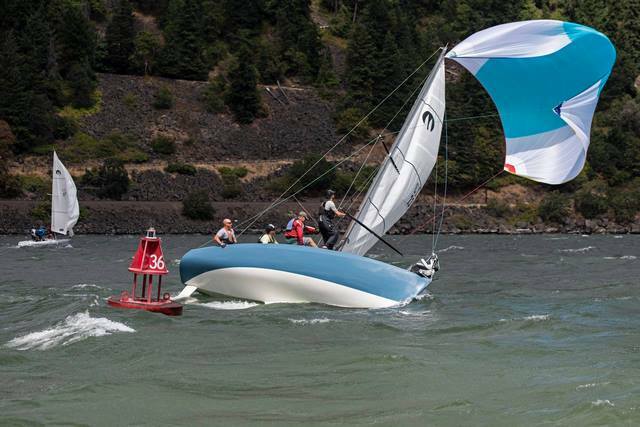 Then you have the Hood River, Oregon fixture Brian I lost my shoes in that wipeout Petros and crew aboard #145 Electric Mayhem sporting their new, yes not used by somebody else before type new, sails! Hailing from Aptos, California is wee little Scott Captain Offset Sorenson who not only can’t decide on a boat name but now has named himself Karl Hungus and #92 LogJammin’ (even though Kung Fu Sock Monkey is still the fan’s favorite) sailing with his 11 year old son Spike aboard on the bow! 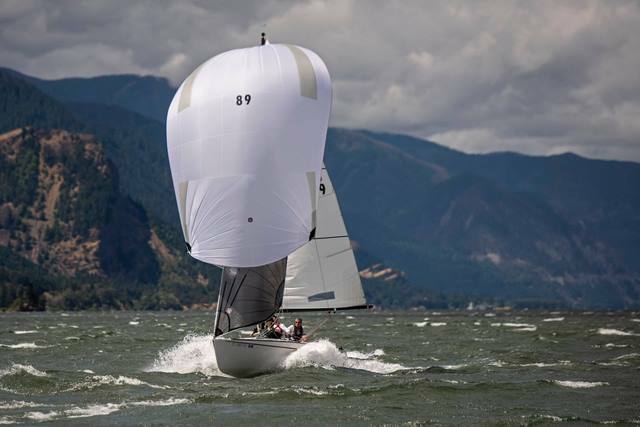 Rounding out the actors and hailing from Hood River, Oregon is 6/16’ths of the local Junior sailing program sailing aboard Morgan I can’t find a cooler boat than a Moore 24 no matter what I sail Larson’s #127 Bruzer on loan due to Larson trying out yet another boat in another city. 12 platforms of actors in this year’s Moore 24 National’s regatta but trust me – there was plenty of personality and action to be had by all. So there we are pulling into Hood River with the van on the verge of overheating in the triple digit temperatures and it’s time to climb up and get those hot in the sun metal poles up off the deck and standing erect with tight wires and strung ropes for the 3 day event ahead. The locals stroll up welcoming all the out of towners and the standard weather conversations start right up. It’ll be breeze-on Friday then a little less Saturday and then light on Sunday. You can easily tell who the cottage cheese and celery crew is as they rush the scale as it comes out of the van and to a one they cheered about making their target weight, cracked a beer and headed to the hood river food court – which true to form is a couple food trailers on a pier by the river – to eat something, anything more solid than chunky cheese products. The hugs, the handshakes, the welcoming smiles, the stories of the trials and tribulations on the delivery’s, family changes or accomplishments – this is why we do this, this is why we are here with these crazy old boats developed out of a good party on a hill. Friday arrived hot (upper 90’s) and windy, just as forecast, and the fleet slowly headed out for the first start (at a very respectable 12 noon start time) with the breeze a little left of center and the starting area just southwest of event site buoy at the end of the sandbar, about 15 feet of water and out of the current. That’s always the trick here, wind angle, waves & river current. Each has to be considered and each has to be considered in how it’s strength matches up to the other three and it’s always changing as the day goes on. Wind angle moves, the current goes up and down depending on how much water gets dumped from the river pond between the dams and the waves, the waves get big and wind has to be strong enough to make up for the lost speed to be out sailing in the current that is creating the big waves – it’s a fluid, always changing, never the same way type of sailing site. You gotta pay attention, make choices and don’t believe that just cause last time it paid here it’s going to again. Oh and you often have to hang on. So there we are on Moore Uff Da rolling into our first start – not a bad one, on the line and moving but a few boats back from the front and as we all quickly tacked over to port for the run up Wells Island to the Hatchery buoy. Winds were in the high teens, gusting into the low 20’s. We ended up getting bumped again to the left by a starboard tack boat and once back on Port realized that hey, we don’t look too shabby on the left. The wind angle was similar across the water but without the waves we were trucking along towards the weather mark. Next thing we knew we were coming into the mark and the 2nd place boat was 5 boat lengths behind us! Adversity is a funny thing, sometimes it hammers you down but if you quickly overcome it adversity can push you even harder. So Jennifer, my wife and our bow girl, has a damaged hand from the previous Friday evening sail in Seattle so she is holding on a little more and little differently than normal. As she went to raise the spinnaker she ran her hand down the mast and released our Main Halyard. Rounding first, spinnaker going up, mainsail going down and off we shoot on a plane, extending our lead. The mainsail went back up easily so not much harm there but then we came up to the Wells Island Buoy – “Ben, you can’t go between the Wells Island Buoy and the beach unless it’s a mark in the course” – I’m told. “Huh,” I say, “I thought it was the event site buoy that had that rule.” “Nope, it’s this buoy.” “Ok then, let’s gybe around it!” So we gybed over to port in a good puff, went down around the buoy and gybed back to starboard realizing because of the puff we gybed on we extended even more. Then we checked the Sailing Instructions and no, the crew had the buoy wrong, it was the event site buoy that had that restriction not Wells Island. But we extended anyways so no harm. We round the leeward mark, have a great clear air second leg around the course again and by the second time we get to the leeward mark at the event site we’re something like 30 boat lengths in front of #145 – what could go wrong? Bam, the jib halyard clutch breaks and down the jib comes halfway to the finish. The bow girl rushes to the mast, runs her hand down it again and wouldn’t you know it the mainsail came down too! We recovered very quickly considering, but not enough to hold on to first and #145 inched by us at the finish line to take the win – literally an inch. There we are now, one race down and were not sure which sails need to stay up and which are supposed to come down – and when. We have the Jib halyard ran through a block at the base of the mast and to one of the two winches we have on the boat to tension it and cleat it off leaving one winch for the trimmer to use on the jib going to weather. Couple tacks off the line and the trimmers is now espousing how he likes this – “it’s so confusing sometimes,” says Andy, “I mean the lines are all in different places and now it’s just in one place. I kinda like it.” But we didn’t like Mr. high target weight on the lee side during one tack so our much lighter weight office girl Mel starts trimming in the port tack – now the trimmer is even happier – he has half the work! The next two races went off well and had some great breeze building into the low 20’s and shifting a little to the right of center. The second race had us heading to the very close to the starting area Wells Island Buoy and as you can guess there wasn’t much separation of the fleet as we rounded the first mark, a couple of us got around cleanly and then the pack was there – a messy rounding. The next leeward mark wasn’t much better with a big group coming in fast towards boats that have just dropped their chute to round and are moving slow, the standard “Don’t Go In There! No Rights!” are yelled out, but how do you stop your boat? A couple minor collisions and barging’s occurred and a few circles followed but after that is was off to the drag races and the long slog up to the Hatch. So here is how things work in Hood River – there are web cams set up everywhere, there are the standard weather forecasts and the cult following weather guru blogs and they all get it wrong! Saturday was supposed to be lighter than Friday and a little cloudy – they get the clouds right. And clouds, when they line up just west of Hood River and it’s sunny to the east generally means wind and we had wind. There we are again with a good start, definitely leaning left, out of the channel and more towards Wells Island than most of the fleet and just like Friday we come into the mark and round a couple boats back and are in the hunt down to the leeward mark and work the left back to weather out of the big waves of the channel and round a few boat lengths in front of #145. Both zooming along in 20+ we had em, they tried the sailing low thing I did the previous day but they got so low there was no way they could come up to the mark and finish in front of us because my bow was just below the mark and I needed to come up to finish. “Ben, are you going to gybe for the finish?” I hear. “No, why would I gybe? I’m just low of the finish pin!” “Uh Ben, the finish is over there to the left. You know, where Brian is headed.” Yep, that was me. Heading for the start pin, thinking it’s the finish. In my defense the start and finish marks are the same size, color and shape. 2nd place again behind Electric Mayhem. We’re just giving these away! 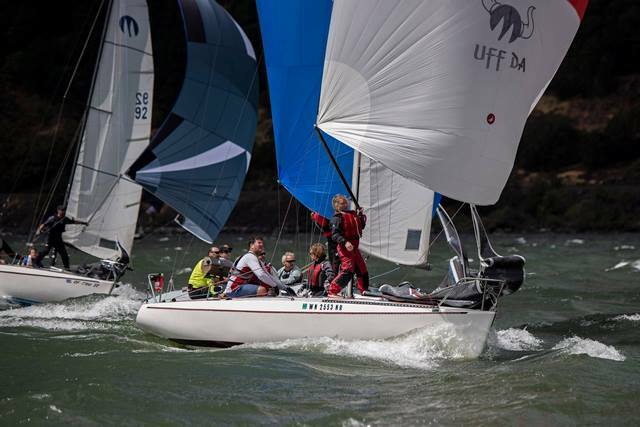 The next race, #5, was finally our race and after working through a few boats we finally had our first win on the weekend, with Mooretician just behind us in 2nd and #145 way back in 9th after a good wipeout and barely avoiding spending some time on the beach. No throw outs this regatta – you sail it, you own it. So now it was time for everyone’s favorite Moore 24 Nationals signature race – the Distance race. Start, upwind to the Hatchery buoy near Swell City then down around the event site mark to starboard, through the center span of the bridge and off downwind to the Chicken Charley Island sand bar Buoy and back upwind through the center span of the bridge and a short jib reach to the finish at the entrance to the Hood River marina. So there we are, the inside boat at the event site buoy rounding and in front us is Snafu. I had planned to come around the mark and slip under their transom and head low to the center span of the bridge – but they had other plans. Up we went to the beach with them bringing us up quickly to the wipe out point. Our spinnaker flogged and the next thing we knew it was around the windward side of the mast and plastered against the mainsail. Take it down quick I yelled, hoping it wouldn’t go higher and over the top of the mast. But Andy started slowing pulling on the sheet and in 10 seconds it came back down and around the mast and was pulling hard again. Lost a couple boats but we were back in it and off on a plane. As you move away from the cloud line and towards the sun it generally gets windier and wow did it get windier – certainly over 30 as we went bow down planning towards Chicken Charlie Island with a few gybes still to do. Then we come across Snafu on their side after a solid wipeout, on their side but on port. We’re on Starboard…. “Put that bow back up, Starboard!” Karma and all caught up, but there were some unhappy faces on Snafu with that Starboard call. Then we came across #145 coming off the beach on Port and since we saw them as our points competition and, well, we were on Starboard we held for them to gybe back to starboard before we absolutely nailed our gybe over to Port and found ourselves on a course just above the leeward mark. Now we’re zoomin, no idea how fast but bow down planning in a Moore 24 in over 30 knots is generally in the high teens. We didn’t want to gybe again with the chute up so close to the leeward mark for fear of messing up the gybe in this breeze or nailing it and zooming past the mark before we can get our chute down. Instead we took the chute down, gybed over and sailed the last bit under main and jib, rounded the mark cleanly and found ourselves in 3rd place behind Banditos and Wet Spot. We managed to pass Wet Spot at one point but then lost them again when I overthought what I expected would be a lifted tack but instead ended with a huge header and drop in wind speed, letting them by again. They held on to the finish to take second but not bad – a third on the distance racing after battling back from the round up, not bad at all. Then the results came out and would you know it – we’re sitting in first place at the Moore 24 Nationals and its Saturday night! Time for dinner and off to the Shed for BeauRitas! I get a text from Morgan Larson during dinner from wherever he is on the great lakes sailing a not-a-Moore texting “great work, don’t drink too many BeauRitas tonight at the Shed.” “Really,” I text. 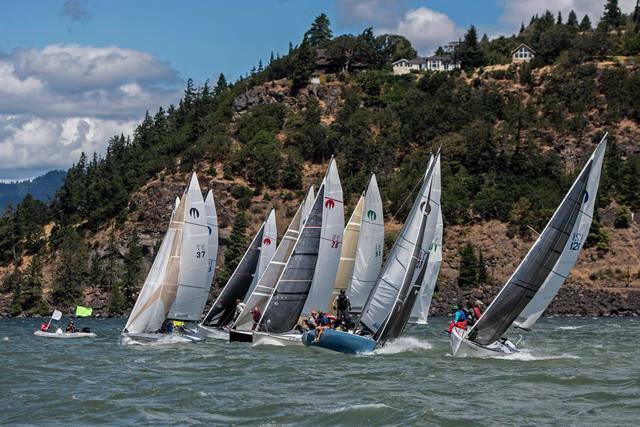 “Ok,” he responds, “Three is your limit.” Beau is the Moore 24’s bartender in Hood River and each time there is a regatta in Hood River the fleet will fill up this little bar and get entertained by our bartender for hours – good times with great people. So Sunday arrives a little earlier than it should have and we have just 2 races scheduled and 5 points on Mooretician and 6 points on Electric Mayhem. Easy to rack up that many points in 2 races – remember, no throw-outs. So Sunday was lighter than the other two days, the forecasters got that right, but bottom end of the #3 isn’t the “Light” everyone was thinking about so many had out their #1’s, some had #2’s and some had #3’s for the first start. We went with the 2 and it was ok at the start but way too big halfway up the course and we switched to the #3 downwind which of course was not enough at the leeward mark but ok about halfway back to the windward mark and great up by the Hatchery. We went from wishing we had the 3, to wishing we had the 2 to happy about the 3 but in the end with all this sail focus pocus we gave Mooretician a gift and let them put 3 boats between us. One race left and we have the lead by 2 points. For the final race the winds picked up to be solidly in the bottom range of the #3 and we had a less than stellar start and found ourselves mid fleet again and it was time to go to work. By the second upwind we had Mooretician out in front of us but down to the right in the channel and bigger waves with us up to the left in less waves but the same breeze – the unknown is always the current. Mooretician finally came off the right on starboard and crossed us by inches before tacking over – we had the speed and worked out in front and up on them while Snafu unintentionally covered them from above as they were coming in on port tack layline. We rounded and set, had a nervous run doing our best to keep ourselves between Mooretician and the finish and wouldn’t you know it, despite our best efforts at times, we finished in front of #89 and had the win for the weekend! 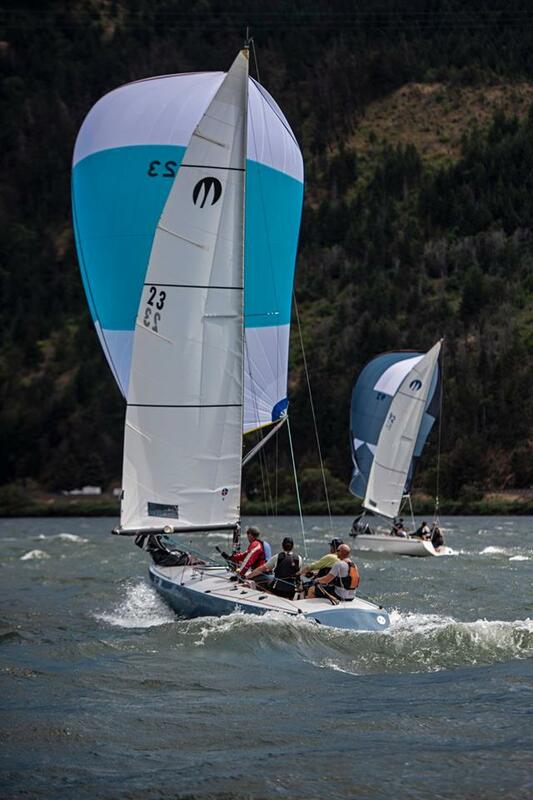 Moore Uff Da, #26, the boat that sails with a BBQ on the pushput, Moore 24 National Champions in some challenging Hood River conditions against some great sailors and great friends from all along the west coast. Something we never expected, never really worked towards as a goal in itself. 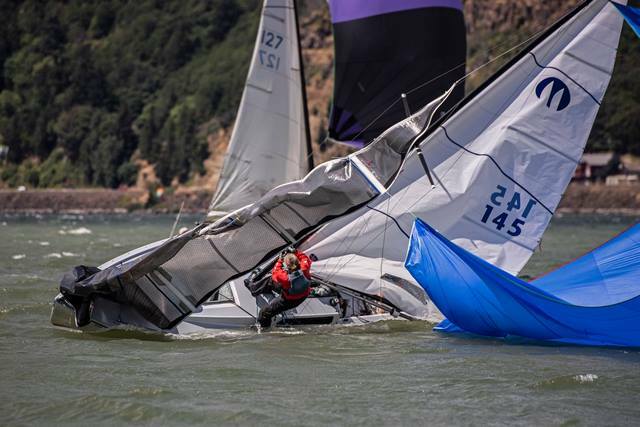 You always try to do better, to win a race, but in this fleet, with these quality sailors, our odds of winning an event like this are generally low. Well look at this – Jennifer Braden, Melanie Edwards, Andy Schwenk, Ben Braden and our 1978 Moore 24 #26 More Uff Da – National Moore 24 Champions – how cool is that! It’s honestly surreal thinking about it a few days later. 13 years sailing our Moore 24 all over the west coast and Canada. We’ve had great wins and great losses but most importantly this little boat has built us some amazing friendships with some crazy fun people and created some of the most head shaking and sometimes even proud memories that we’ll hold onto forever. 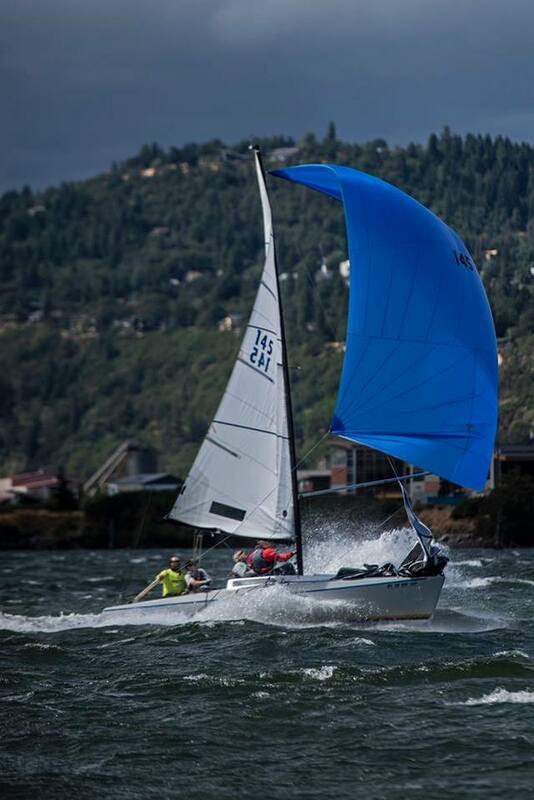 Thank you to all of you Moore 24 owners and sailors that keep these fun times going and thank you to our fleet leadership that promotes the innovation and improvements that keep our little boat viable and desired by both the old school Moore 24 T.M.D.S. sailors and those new to the fleet that need just one more zoom before their T.M.D.S. sets in for good. Here’s to Just One Moore! Photo Credits to Sean Trew, Julio Paredes and Wet Spot Crew – thanks guys!